On The Financial Times: There were two distinct telecom markets: competitive countries where prices of data packages were affordable owing to a challenger operator and 'protected telecom oligopolies' where large incumbent groups can suppress demand by commanding higher prices and undermining free access of internet services. The real stakes of net-neutrality, capacity for open-internet and competition are on the mobile and not the fixed-line side. Unlike in fixed-line where flat-rate unlimited consumption has been the norm, mobile internet users have been conditioned to volume caps and gigabyte-metered plans. If mobile network operators in controll of the radio spectrum are overpricing gigabytes of open-internet access, they can easily force consumers to chose telcos' own 'specialised services' instead - which are not counted in the open-internet consumption. Should the spectrum owners (states), regulators and competition authorities allow this to happen or make legal guarantees that most of the scarce radio spectrum capacities must be used by the telcos to provide competitively priced open mobile internet access? In those EU markets where competition between telecom operators can be best described as friendly net-neutrality is already on protracted coma – and the planned no-blocking & throttling rules of Neelie Kroes’s Connected Continent package will be no panacea. 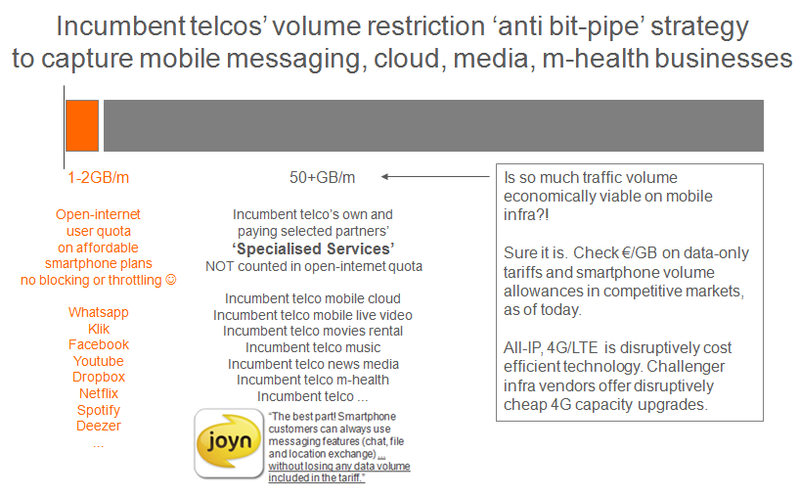 In protected telecom oligopolies (where no challenger mobile operator is present) all parallel fixed-line and mobile infrastructures and radio spectrum have already been or soon are to be consolidated in the hands of few friendly voice-era incumbent telecom groups with vested interests in protecting valuation of their fixed-line assets. In these markets telcos have already started to collectively restrict the maximum volume of open-internet cosumption on affordable smartphone tariff plans to just few Gigabytes. In contrast, in genuinely competitive markets, such as the UK, Finland and Austria, consumers could choose affordable (€15-€30) smartphone tariff plans that include very large (>10GB) or unlimited Gigabyte volume allowance. In protected oligopoly markets consumers have no choice for affordable open-internet. By spending monthly an amount that lies within what can be considered an affordable range for EU28 and OECD countries (€15–€30 or $21–$42) they get nothing but a dismal 1GB of volume for open-internet. On the other side in competitive markets where a challenger mobile operator is present consumers by spending €20–€30 per month gain access to very large or practically unlimited volumes of open-internet on their smartphones. On the 18th of March 2014 a committee of the European Parliament voted in favour of an amended version of the Commission’s proposal known as Connected Continent. The MEPs in the ITRE committee of the European Parliament approved a vague net-neutrality definition while opening a back-door to anti net-neutrality practices code named “specialized services”. This text faces an uncertain European Parliament plenary vote scheduled for April. But even if the EU and the US legislate and enforce strict net-neutrality rules (i.e. no blocking or throttling and no deteriorating the speed of the open-internet access) if higher speeds are reserved for “specialized services” still net-neutrality can be easily bypassed in consolidated protected markets if telcos collectively restrict the volume of open-internet consumption (e.g. 1GB volume open-internet but with an extra charge you get access to the telco’s own or its partner’s cloud and video services – not metered inside the open-internet volume allowance). Consumers will have a choice of unrestricted and affordable priced open-internet only in competitive markets where infrastructure and spectrum based competition is fierce and driven by the genuine economic interest of challenger operators to attract as many customers as possible by maximizing the use of their spectrum and loading their networks. Further consolidation, if allowed will trigger the certain death of net-neutrality and affordable open-internet.